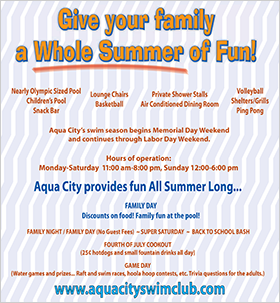 Aqua City provides fun all summer long with events such as; Family Day, Family Night, Fourth of July Cookout, Back to School Bash (for our school age members). Invite ALL YOUR FRIENDS (No Guest Fees All Day)! 4:00-9:00 pm. Grilled Burgers and hotdogs will be served free to members and their guests. Potluck style dinner. Bring your favorite side dish. 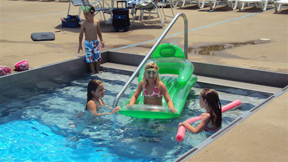 Family fun at the pool! Freedom dogs (free hotdogs) and 25 cent small drinks all day. Also party jump rentals will provide jump houses! Fun for everyone! Come join us before you head out to see the fireworks. Lots of water games and prizes for all ages starting at noon. Raft and swim races, hoola hoop contests, etc. Trivia questions for the adults!